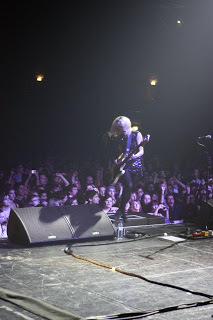 Charlotte Cooper, bassist and vocalist for The Subways, is a rock chick, festival queen, marathoner, half ironman and soon-to-be full ironman, and she still found the time to talk to me for my blog. This lady is superhuman! 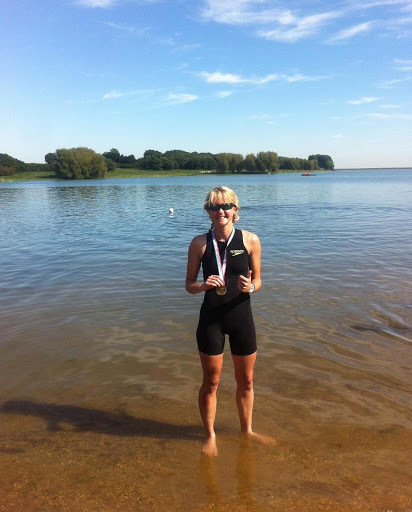 You just completed your first half Ironman triathlon, how did you find it? I absolutely loved it! It was a perfect day for it too, glorious sunshine. The water temperature was 19C too! There were definitely times that it was tough, especially the second lap of the bike. I set off way too fast and paid for it a bit – I just got over excited! The run was just brilliant; I was smiling the whole way round. You’re currently on the UK leg of your tour with the Subways, how do you find time to train between gigs? Run training is easy. I heard a quote once: Where there’s a runner, there’s a run. I think this is very true, all you need is your trainers! Swimming and cycling are logistically harder to fit in, though I do take my bike with me on tour when I can. I spend a lot of time looking at maps for routes and swimming pools! 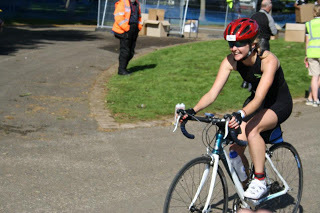 This summer we had festivals every weekend and were home during the week, so I crammed all my cycling and swimming training into the week and ran when we were away at weekends. My training wasn’t ideal, but I focused on my one key session of the week which was a 50ish mile ride followed by a 6 mile brick run. You’re doing the Challenge Roth Ironman next year, what made you choose to tackle this ultimate distance? I’m a lover of long distance; the marathon is my favourite run distance. I think ironman is the ultimate challenge and I just think it’ll be an amazing experience. I’m so excited to get stuck into training! So what is a normal training week for you? It fluctuates throughout the season, but I basically try to get in 3 sessions of each sport. This doesn’t always happen so I focus on key sessions, like a good long brick, a turbo session, an endurance session in the pool, an interval run session and a long run. I’ll be getting advice from a coach before embarking on my Challenge Roth training though, and hopefully getting a personal training plan. Do you have any other fitness goals for the next year? My main goal is obviously to do my very best at Challenge Roth, but I do have some sub-goals within that. My cycling is my weakest discipline, so I’ll be focusing on trying to improve that. I’ve been going on rides with faster cyclists and I’m going to start doing some weight training at the gym to improve strength. With swimming I just need to get a bit more focused, I could be so much faster if I bothered with it more! I’ll be maintaining my running with long slow runs and a speed session once a week. I find that cycling really improves running strength anyway. You achieved a fantastic personal best of 3:28:58 at the Virgin London Marathon this year; do you plan to do another Marathon in the future? Oh definitely! I love the distance. I’d like to do Berlin next perhaps; I’ve heard it’s really flat! There are marathons in so many awesome places. I’ve heard about one in Norway that starts at 9pm, but it’s still daylight. Are there any healthy eating rules that you follow? There is an argument that you can eat what you want when you’re training so much and I do follow this! I love chocolate, cake and wine. I do eat my 5 a day and have carbohydrates with every meal and try to meal the meals as healthy as possible, but I have my indulgences! How do you usually fuel for your races? For the bike leg I take on High5 gels every half hour with lots of water, then something solid after 2 hours – a Double Decker chocolate bar is usually what I go for! I can’t handle anything other than energy drink on the run, so I just try to take a couple of sips at every feed station. Imagine: you’ve just turned off your alarm at some ungodly hour and you have to head out for a run but the cold side of the pillow is calling your name, how do you motivate yourself to get out the door? Or don’t you have days like that?! I think everyone has days like that! Sometimes, especially in the off-season I think it’s important to follow what your body is telling you. But essentially I do this (training) because I enjoy it so I normally want to train. I do some runs and rides with friends which is great. I’ve got a good friend who I do track sessions with once a week. We’re about the same standard (well, she’s a bit faster than me!) so we push each other but also gossip! 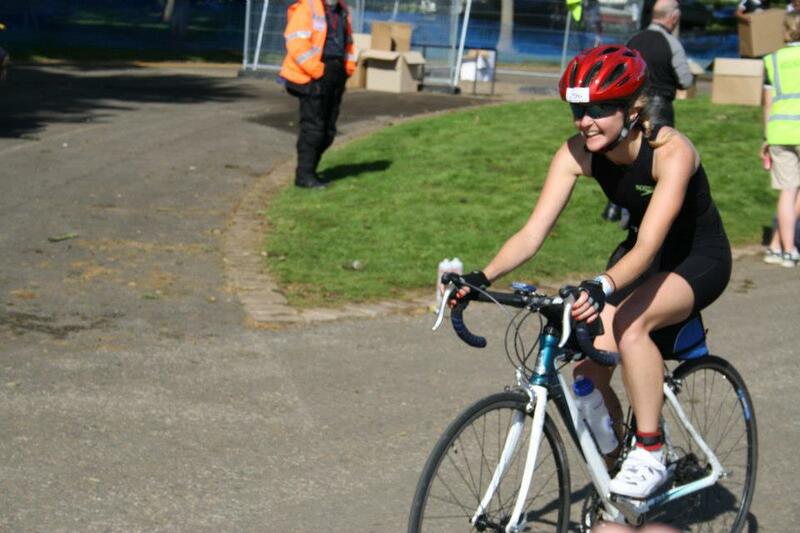 What’s your favourite part of being a triathlete? Racing!! There is nothing better than the feeling you get before, during and after a race. I love how victorious it makes you feel; like you can do anything! Hanging up my swimming stuff! Don’t know why, it’s just one of those jobs I find really annoying! Songs like “Shake! Shake!” from your second album and “We Don’t Need Money to Have a Good Time” from your most recent release are great for training, what music do you have on your training playlist? I never cycle with music and I watch really bad TV when I’m doing a turbo session! I run a lot without music, especially if I’m in a beautiful location. But if I do listen to music I like songs that make me want to dance and sing – which I sometimes do! So my playlist consists of everything from Kylie Minogue to The Bronx to Cyndy Lauper. I also listen to podcasts on longer runs, like Marathon Talk or IM Talk – they’re really motivational. And she still has the energy to dance! Do you ever get a chance to relax? What do you do? When I’m asked this question in interviews I always say swimming, cycling and running is my relaxation. It’s what I love to do and I get so much enjoyment out of it. But if I’ve just done a long hard session there’s nothing better than a pub, good food and good wine! 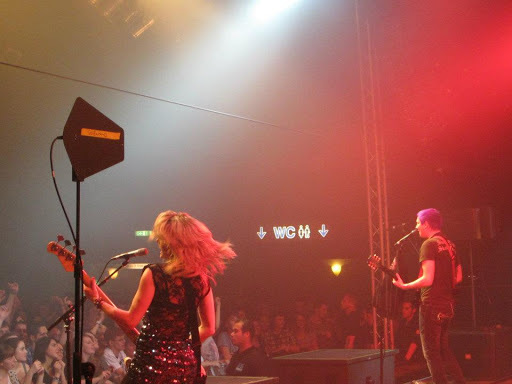 You can download The Subways’ latest album “Money and Celebrity” here, and check out http://thesubways.net/gigs/ for tickets for The Subways’ UK tour. Next Post Zombie Evacuation… Only the Fittest will Survive!